Fabrication of the pathfinding version of NASA’s Orion crew capsule slated for its inaugural unmanned test flight in December is entering its final stages at the Kennedy Space Center (KSC) launch site in Florida. Engineers and technicians have completed the installation of Orion’s back shell panels which will protect the spacecraft and future astronauts from the searing heat of reentry and scorching temperatures exceeding 3,150 degrees Fahrenheit. Orion is scheduled to launch on its maiden uncrewed mission dubbed Exploration Flight Test-1 (EFT-1) test flight in December 2014 atop the mammoth, triple barreled United Launch Alliance (ULA) Delta IV Heavy rocket from Cape Canaveral, Florida. The cone-shaped back shell actually has a rather familiar look since its comprised of 970 black thermal protection tiles – the same tiles which protected the belly of the space shuttles during three decades and 135 missions of returning from space. However, Orion’s back shell tiles will experience temperatures far in excess of those from the shuttle era. Whereas the space shuttles traveled at 17,000 miles per hour, Orion will hit the Earth’s atmosphere at some 20,000 miles per hour on this first flight test. The faster a spacecraft travels through Earth’s atmosphere, the more heat it generates. So even though the hottest the space shuttle tiles got was about 2,300 degrees Fahrenheit, the Orion back shell could get up to 3,150 degrees, despite being in a cooler area of the vehicle. Engineers have also rigged Orion to conduct a special in flight test to see just how vulnerable the vehicle is to the onslaught of micrometeoroid orbital debris. Even tiny particles can cause immense and potentially fatal damage at high speed by punching a hole through the back shell tiles and possibly exposing the spacecrafts structure to temperatures high than normal. “Below the tiles, the vehicle’s structure doesn’t often get hotter than about 300 degrees Fahrenheit, but if debris breeched the tile, the heat surrounding the vehicle during reentry could creep into the hole it created, possibly damaging the vehicle,” says NASA. The team has run done numerous modeling studies on the effect of micrometeoroid hits. Now it’s time for a real world test. Therefore engineers have purposely drilled a pair of skinny 1 inch wide holes into two 1.47 inches thick tiles to mimic damage from a micrometeoroid hit. The holes are 1.4 inches and 1 inch deep and are located on the opposite side of the back shell from Orion’s windows and reaction control system jets, according to NASA. “We want to know how much of the hot gas gets into the bottom of those cavities,” said Joseph Olejniczak, manager of Orion aerosciences, in a NASA statement. The data gathered will help inform the team about the heat effects from potential damage and possible astronaut repair options in space. Orion is NASA’s next generation human rated vehicle now under development to replace the now retired space shuttle. The state-of-the-art spacecraft will carry America’s astronauts on voyages venturing farther into deep space than ever before – past the Moon to Asteroids, Mars and Beyond! The EFT-1 mission will test the systems critical for future human missions to deep space. 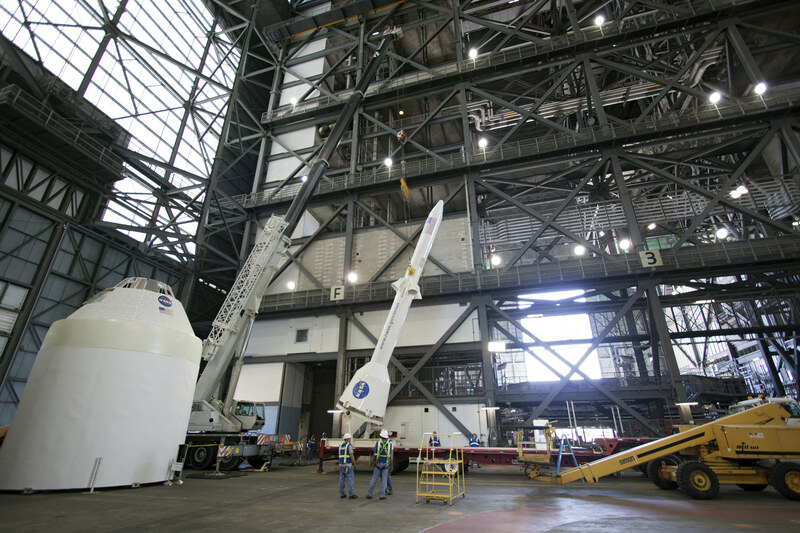 Orion’s back shell attachment and final assembly is taking place in the newly renamed Neil Armstrong Operations and Checkout Building, by prime contractor Lockheed Martin. One of the primary goals of NASA’s eagerly anticipated Orion EFT-1 uncrewed test flight is to test the efficacy of the heat shield and back shell tiles in protecting the vehicle – and future human astronauts – from excruciating temperatures reaching over 4000 degrees Fahrenheit (2200 C) during scorching re-entry heating. At the conclusion of the EFT-1 flight, the detached Orion capsule plunges back and re-enters the Earth’s atmosphere at 20,000 MPH (32,000 kilometers per hour). The Orion EFT-1 vehicle is due to roll out of the O & C in about two weeks and be moved to its fueling facility at KSC for the next step in launch processing. Orion will eventually launch atop the SLS, NASA’s new mammoth heavy lift booster which the agency is now targeting for its maiden launch no later than November 2018 – detailed in my story here. KENNEDY SPACE CENTER, FL – The heat shield crucial to the success of NASA’s 2014 Orion test flight has arrived at the Kennedy Space Center (KSC) aboard the agency’s Super Guppy aircraft – just spacious enough to fit the precious cargo inside. Orion is currently under development as NASA’s next generation human rated vehicle to replace the now retired space shuttle. The heat shields advent is a key achievement on the path to the spacecraft’s maiden flight. “The heat shield which we received today marks a major milestone for Orion. It is key to the continued assembly of the spacecraft,” Scott Wilson, NASA’s Orion Manager of Production Operations at KSC, told Universe Today during an interview at the KSC shuttle landing facility while the offloading was in progress. The inaugural flight of Orion on the unmanned Exploration Flight Test – 1 (EFT-1) mission is scheduled to blast off from the Florida Space Coast in mid September 2014 atop a Delta 4 Heavy booster, Wilson told me. The heat shield was flown in from Textron Defense Systems located near Boston, Massachusetts and offloaded from the Super Guppy on Dec. 5 as Universe Today observed the proceedings along with top managers from NASA and Orion’s prime contractor Lockheed Martin. “The Orion heat shield is the largest of its kind ever built. Its wider than the Apollo and Mars Science Laboratory heat shields,” Todd Sullivan told Universe Today at KSC. Sullivan is the heat shield senior manager at Lockheed Martin. The state-of-the-art Orion crew capsule will ultimately enable astronauts to fly to deep space destinations including the Moon, Asteroids, Mars and beyond – throughout our solar system. The heat shield was one of the last major pieces of hardware needed to complete Orion’s exterior structure. “Production of the heat shields primary structure that carries all the loads began at Lockheed Martin’s Waterton Facility near Denver,” said Sullivan. The titanium composite skeleton and carbon fiber skin were manufactured there to give the heat shield its shape and provide structural support during landing. “It was then shipped to Textron in Boston in March,” for the next stage of assembly operations, Sullivan told me. Textron technicians just completed the final work of installing a fiberglass-phenolic honeycomb structure onto the heat shield skin. Then they filled each of the honeycomb’s 320,000 cells with the ablative material Avcoat. Each cell was X-rayed and sanded to match Orion’s exacting design specifications. “Now we have about two and a half months of work ahead to prepare the Orion crew module before the heat shield is bolted on and installed,” Sullivan explained. The Avcoat-treated shell will shield Orion from the extreme heat of nearly 4000 degrees Fahrenheit it experiences during the blazing hot temperatures it experiences as it returns at high speed to Earth. The ablative material will wear away as it heats up during the capsules atmospheric re-entry thereby preventing heat from being transferred to the rest of the capsule and saving it and the human crew from utter destruction. “Testing the heat shield is one of the prime objectives of the EFT-1 flight,” Wilson explained. The data gathered during the unmanned EFT-1 flight will aid in confirming. or refuting, design decisions and computer models as the program moves forward to the first flight atop NASA’s mammoth SLS booster in 2017 on the EM-1 mission and human crewed missions thereafter. “I’m very proud of the work we’ve done, excited to have the heat shield here [at KSC] and anxious to get it installed,” Sullivan concluded. Stay tuned here for continuing Orion, Chang’e 3, LADEE, MAVEN and MOM news and Ken’s reports from on site at Cape Canaveral & the Kennedy Space Center press site. A pair of NASA astronauts donned their spacesuits for key fit check evaluations inside a test version of the Boeing Company’s CST-100 commercial ‘space taxi’ which was unveiled this week for the world’s first glimpse of the cabin’s interior. Boeing is among a trio of American aerospace firms, including SpaceX and Sierra Nevada Corp, seeking to restore America’s capability to fly humans to Earth orbit and the space station using seed money from NASA’s Commercial Crew Program (CCP). Astronauts Serena Aunon and Randy Bresnik conducted a day long series of technical evaluations inside a fully outfitted, full scale mock up of the CST-100, while wearing NASA’s iconic orange launch-and-entry flight suits from the space shuttle era. During the tests, Boeing technicians monitored the astronauts ergonomic ability to work in the seats and move around during hands on use of the capsules equipment, display consoles and storage compartments. The purpose of the testing at Boeing’s Houston Product Support Center is to see what works well and what needs modifications before fixing the final capsule design for construction. This is an interior view of The Boeing Company’s CST-100 spacecraft, which features LED lighting and tablet technology. Former NASA Astronaut Chris Ferguson, the commander of the final shuttle flight (STS-135) by Atlantis, is leading Boeing’s test effort as the director of Boeing’s Crew and Mission Operations. “These are our customers. They’re the ones who will take our spacecraft into flight, and if we’re not building it the way they want it we’re doing something wrong,” said Ferguson. The CST-100 is designed to carry a crew of up to 7 astronauts, or a mix of cargo and crew, on missions to low-Earth orbit (LEO) and the International Space Station (ISS) around the middle of this decade. Although it resembles Boeing’s Apollo-era capsules from the outside, the interior employs state of the art modern technology including sky blue LED lighting and tablet technology. Nevertheless Boeing’s design goal is to keep the flight technology as simple as possible. The CST-100 crew transporter will fly to orbit atop the venerable Atlas V rocket built by United Launch Alliance (ULA) from Launch Complex 41 on Cape Canaveral Air Force Station in Florida. Boeing is aiming for an initial three day manned orbital test flight of the CST-100 during 2016, says John Mulholland, Boeing vice president and program manger for Commercial Programs. The 1st docking mission to the ISS would follow in 2017 – depending on the very uncertain funding that Congress approves for NASA. The Atlas V was also chosen to launch one of Boeing’s commercial crew competitors, namely the Dream Chaser mini shuttle built by Sierra Nevada Corp.
NASA’s CCP program is fostering the development of the CST-100 as well as the SpaceX Dragon and Sierra Nevada Dream Chaser to replace America’s capability to launch humans to space that was lost following the retirement of NASA’s space shuttle orbiters two years ago in July 2011. Since 2011, every American astronaut has been 100% dependent on the Russians and their Soyuz capsule to hitch a ride to the ISS. Simultaneously NASA and its industry partners are designing and building the Orion crew capsule and SLS heavy lift booster to send humans to the Moon and deep space destinations including Near Earth Asteroids and Mars. NASA is picking up the construction pace on the inaugural space-bound Orion crew capsule at the Kennedy Space Center (KSC) in Florida – and accelerating towards blastoff on the unmanned Exploration Flight Test-1 mission (EFT-1) slated for September 2014 atop a mammoth Delta 4 Heavy Booster which will one day lead to deep space human forays to Asteroids and Mars. Orion was at the center of an impressive and loud beehive of action packed assembly activities by technicians during my recent exclusive tour of the spacecraft to inspect ongoing progress inside the renovated Orion manufacturing assembly facility in the Operations and Checkout Building (O & C) at KSC. “We plan to power up Orion for the first time this summer,” said Scott Wilson in an exclusive interview with Universe Today beside the Orion vehicle. Wilson is Orion’s Production Operations manager for NASA at KSC. The Orion EFT-1 flight is a critical first step towards achieving NASA’s new goal of capturing and retrieving a Near Earth Asteroid for eventual visit by astronauts flying aboard an Orion vehicle by 2021 – if NASA’s budget request is approved. KSC will have a leading role in NASA’s asteroid retrieval project that could occur some four years earlier than President Obama’s targeted goal of 2025 for a human journey to an asteroid. Capturing an asteroid and dispatching astronauts aboard Orion to collect precious rock samples will aid our scientific understanding of the formation of the Solar System as well as bolster Planetary Defense strategies – the importance of which is gathering steam following the unforeseen Russian meteor strike in February which injured over 1200 people and damaged over 3000 buildings. Dozens of highly skilled workers were busily cutting metal, drilling holes, bolting screws and attaching a wide range of mechanical and electrical components and bracketry to the Orion pressure vessel’s primary structure as Universe Today conducted a walk around of the EFT-1 capsule, Service Module and assorted assembly gear inside the O&C. Lockheed Martin is the primary contractor for Orion. A growing number of employees hired by Lockheed and United Space Alliance (USA) are “working 2 shifts per day 7 days a week to complete the assembly work by year’s end,” said Jules Schneider, Orion Project manager for Lockheed Martin at KSC, during an exclusive interview with Universe Today. I watched as the workers were boring hundreds of precision holes and carefully tightening the high strength steel bolts to attach the top to bottom ring segments made of titanium to the main load paths on the pressure vessel. “We are making good progress on the Orion Service module too. The outer panels will be installed soon,” Wilson explained. The olive green colored crew module was clamped inside the birdcage-like Structural Assembly Jig during my visit. The Jig has multiple degrees of freedom to maneuver the capsule and more easily enable the detailed assembly work. “The technicians are installing strain gauges and secondary structure components to get it ready for the upcoming structural loads test,” said Schneider. For the next stage of processing, the EFT-1 crew module has been lifted out of the birdcage Jig and moved onto an adjacent dedicated work station for loads testing at the Operations and Checkout building. As reported in my earlier article the Orion pressure vessel sustained three ‘hairline” cracks in the lower half of the aft bulkhead during proof pressure testing of the vessel and welds at the O & C.
I was observing as the technicians were carefully milling out the miniscule bulkhead fractures. Workers have now installed custom built replacement brackets and reinforcing doublers on the aft bulkhead. “We will do the protocol loads test with pressure using about 9 different load cases the vehicle will see during the EFT-1 flight. Chute deployment and jettison motor deployment is a driving load case,” said Schneider. “We will also squeeze the capsule,” said Wilson. “That structural loads testing of the integrated structure will take about 6 to 8 weeks. There are thousands of gauges on the vehicle to collect data,” Schneider elaborated. “When we are done with the ground testing program then we remove all the ground test instrumentation and start installing all the actual flight systems including harnesses and instrumentation, the plumbing and everything else,” Schneider explained. Orion hardware built by contractors and subcontractors from virtually every state all across the U.S is being delivered to KSC for installation onto EFT-1. Orion is a nationwide human spaceflight project. Concept of Spacecraft with Asteroid Capture Mechanism Deployed. Credit: NASA. It will then fire braking rockets to plunge back to Earth, re-enter the atmosphere at about 20,000 MPH and test numerous spacecrafts systems, the heat shield and all three parachutes for an ocean splashdown. Meanwhile other Orion EFT-1 components such as the emergency Launch Abort System (LAS) and Service Module are coming together – read my Orion follow-up reports. Humans have not ventured beyond low Earth orbit since the Apollo Moon landings ended in 1972. Orion will change that. April 20/21 : “Curiosity and the Search for Life on Mars – (in 3-D)”. Plus “The Space Shuttle Finale and the Future of NASA – Orion, SpaceX, Antares and more!” NEAF Astronomy Forum, Rockland Community College, Suffern, NY. 3-4 PM Sat & Sunday. Display table all day. The 4 minute film is a compilation of NASA’s gamut of Robotic Science and Human Spaceflight achievements to explore and understand Planet Earth here at home and the heavens above- ranging from our Solar System and beyond to the Galaxy and the vast expanse of the Universe. The missions and programs featured include inspiringly beautiful imagery from : Curiosity, Landsat, Aquarius, GRACE, NuSTAR, GRAIL, Dawn at Asteroid Vesta, SDO, X-48C Amelia, Orion, SLS, Apollo, SpaceX, Sierra Nevada Dream Chaser, Boeing CST-100, Commercial Crew, Hurricane Sandy from the ISS, Robonaut and more ! And even more space exploration thrills are coming in 2013 ! This week, researchers tested a ten-foot-long model of the new Space Launch System, NASA’s next big thing for launching humans beyond Earth orbit. The test was conducted at the Langley Research Center’s Transonic Dynamics Tunnel (TDT). “This is a critical milestone for the design of the vehicle,” said Langley research engineer, Dave Piatak. Data retrieved will help prepare SLS for its first mission in 2017, Exploration Mission-1 (EM-1), which will deliver an uncrewed Orion spacecraft to lunar orbit to check out the vehicle’s systems. But before SLS’s first flight, the safety vehicle must be demonstrated through analysis and testing. An important step in ensuring a safe flight to orbit is buffet wind-tunnel testing to help determine launch vehicle structural margins. To do this, a wind-tunnel model is put through its paces at transonic and low supersonic speeds reaching up to Mach 1.2. Testing aerodynamics at these speeds is essential to understanding the structural interaction to the flow field around the vehicle and determining loads on the flight vehicle. 360 miniature sensors on the model’s surface are scanned by a data acquisition system scanning at thirteen thousand scans-per-second. Unlike the rigid SLS buffet wind-tunnel model, the real launch vehicle is quite flexible. The rocket will bend and shake in response to forces during flight, and engineers use tests like this to determine that the resulting bending loads and vibrations are within the launch vehicle’s safe limits. NASA engineers are now analyzing the data, and will be used to help refine the design of the SLS vehicle before the full-size rocket is built for flight tests. After completing EM-1, SLS will perform its second mission in 2021, Exploration Mission-2, launching Orion with its first crew of astronauts to demonstrate orbit around the Moon.